Visitors to one of the UK’s most famous flower borders, at Newby Hall in Yorkshire, can sit back and get a new perspective on the floral landmark, thanks to a GIANT hand-crafted replica of a priceless Chippendale chair. 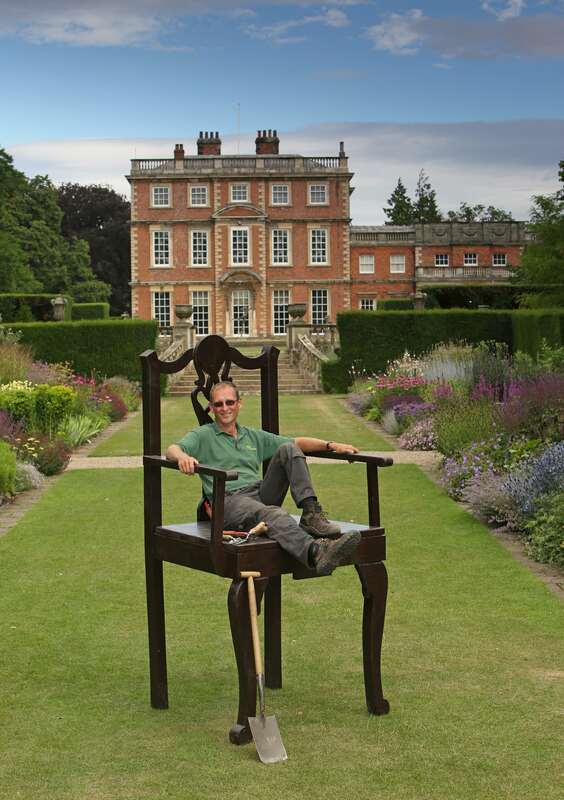 Newby has one of the best Chippendale collections in the country and, to mark the 300th anniversary of the renowned furniture maker’s birth and the opening of a new Chippendale exhibition, it has unveiled a 2.2m high wooden chair at the end of its famed double herbaceous border. Visitors can now climb up to get a new view of the magnificent 172-metre-long flower beds – some of the longest in the UK – which are packed with around 6,500 plants. 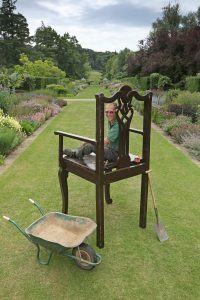 The oversized chair has been handmade by craftsmen on the Newby estate and will be ‘planted’ in the garden over the summer months. Newby Hall & Gardens is marking the ‘Year of the Border’ this year as its flagship border reaches peak flower power. The border has been a highlight of Newby’s beautiful 25-acre gardens since the 1920s and five years ago refurbishment work began to make sure it continues to wow for years to come. Over several growing seasons, thousands of new plants were propagated or grown on and carefully planted up in a new, more naturalistic design by Newby’s expert team. This summer sees the hard work pay off as the plants mature and start to claim the stunning spacious border, which runs from the magnificent 17th century house down to the River Ure, for their own. The scale of the border means that staking the plants in the spring takes three days alone, whilst cutting it back in the autumn takes over a fortnight. Newby Hall & Gardens is one of the country’s most important and beautiful 20th century gardens – certainly, one of the North’s finest – boasting 14 ‘rooms’ within the main, formal garden including an early 20th century rock garden, serene white garden, traditional rose garden and even a ‘hot’ tropical garden. 1Thomas Chippendale was commissioned to provide furniture for Newby, including some fabulous Tapestry Room chairs, uniquely covered with fabric from the Gobelins Factory in Paris. This is the only Chippendale suite with its original covers and still in its original setting, and the Tapestry Room is the most complete Chippendale interior in existence. Together with dining chairs, hall chairs, card and Pembroke tables, the Newby Hall collection is internationally celebrated as one of the largest and most complete in private ownership anywhere. Until September 2018, there will be guided tours exploring the contribution Chippendale made to Newby Hall. Additional items of Chippendale furniture from other collections will also be displayed, illustrating the breadth of Chippendale’s skill. Chippendale Tours Wednesday and Saturday 3pm – please ask when buying your House tickets. The gardening team has 6 full time gardeners and a handful of volunteers. They care for the 25 acres of formal gardens and a further 15 acres of woodland and orchard. Newby Hall is just a few miles from the A1(M), the main London to Edinburgh motorway. Close by are the magnificent Yorkshire Dales, North Yorkshire Moors National Parks and the historic cities of York and Ripon.